Workman Publishing Company, 9780761169086, 480pp. 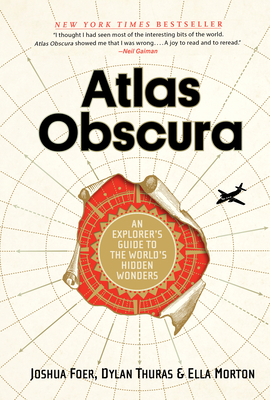 Joshua Foer is the cofounder and chairman of Atlas Obscura. He is also the author of Moonwalking with Einstein: The Art and Science of Remembering Everything, a bestseller published in 33 languages, and a forthcoming book about the world's last hunter-gatherers. Ella Morton is a New Zealand-born, Australian-raised, Brooklyn-based writer, focusing on overlooked aspects of history and culture. After covering consumer technology at CNET she hosted Rocketboom NYC, a web show about New York’s quirkier people and places. Her most popular interview was a chat with Cookie Monster on the set of Sesame Street. Ella was associate editor at AtlasObscura.com, where she wrote about such topics as tobacco smoke enemas, Victorian streaming music services, and the etiquette of marrying a ghost.